Cincinnati Insurance has begun offering LifeSaver's distracted driving software system that includes a dashboard and mobile app for drivers. 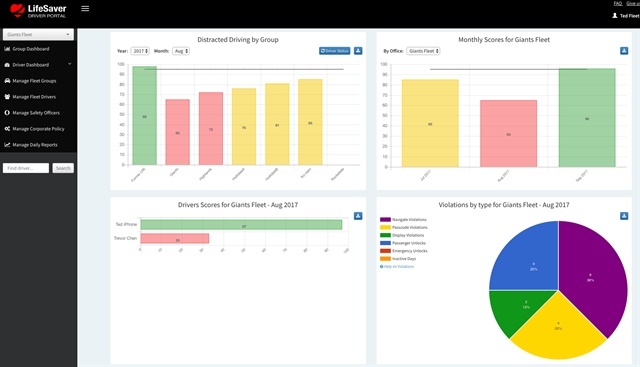 The system allows companies with commercial policies to measure and enforce their distracted driving policies around cellphone use by their fleet drivers. Recent statistics show that phone-related distracted driving causes one in four crashes. A recent survey of insurance agents found that distracted driving was responsible for more than 25 percent of collisions on U.S. roadways, according to LifeSaver. "Despite the rising costs of commercial auto insurance, businesses now have a clear path to reducing at-fault collisions and managing their insurance costs," said Ted Chen, LifeSaver’s co-founder. "We applaud Cincinnati Insurance for taking a lead role in stemming the tide of the distracted driving epidemic. The LifeSaver solution enables Cincinnati policyholders to reduce risk with tools that encourage their employees practice safe driving when they’re on the job." Commercial policyholders face an increased risk, given the disproportionate number of miles and hours that their fleet drivers are on the road. Cincinnati Insurance is taking a proactive step to lower this risk by offering an innovative corporate/fleet safety option like LifeSaver to these policyholders at an affordable price. “Through this program, we can provide a simple, cost-effective way for our commercial customers to address distracted driving, potentially reducing auto claims and, most importantly, saving lives. LifeSaver’s software-only approach is an innovative way to support our policyholders’ efforts to reduce risk and manage insurance costs,” commented Steve Spray, Cincinnati Insurance’s senior vice president of commercial insurance.